Today is another example of an easy outfit - trousers and a pullover. That's it. 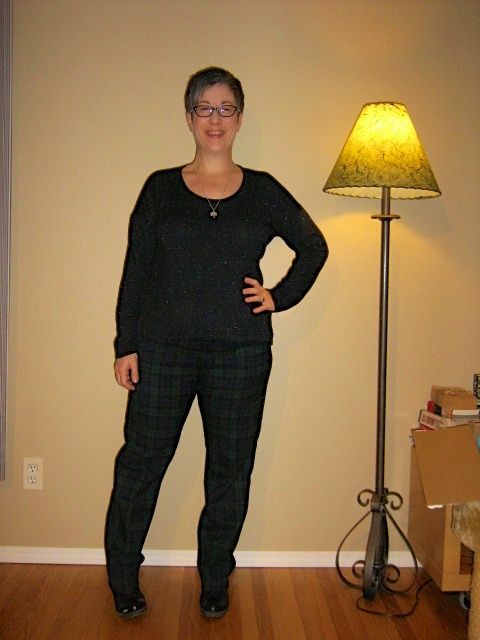 I chose my black watch tartan trousers to start with and decided to pair them with my navy sparkly sweater. I actually popped on my navy Lanai blazer over top of that and although it worked well, decided I wanted to be a little simpler today with less layers. For footwear I went with my Doc Marcie wedge boots and chose my black leather handbag. For jewelry, I'm wearing my silver wedding band and the silver tree necklace my hubby gave me for Christmas. Nothing fancy but I think this works together…yes? As always, all comments/suggestions welcome. ETA: I have NO idea what is happening with my crotch area in pic #2 - I swear the trousers don't look like that. Must have been the way the pants pulled in by the way I was standing. Yikes! After a good month of upheaval on many levels, I'm starting to feel like ME again and this outfit is the stylistic illustration of that. 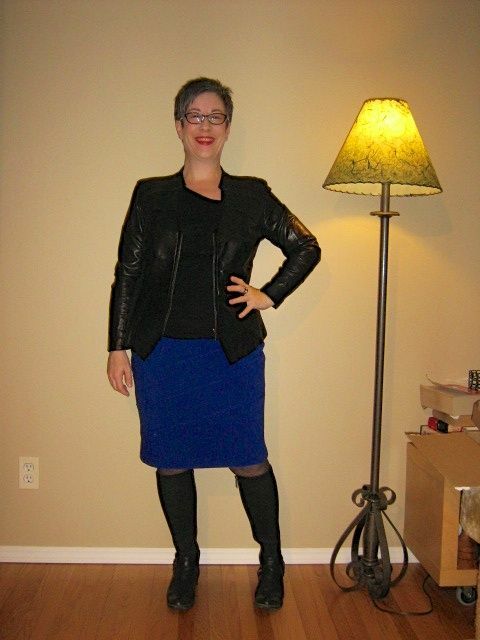 I started today's outfit with my cobalt pencil skirt, which I haven't worn in ages. For some reason I had it in my head that this skirt is for spring/summer/fall only and not for winter - how silly! So I paired the skirt with my black ruched asymmetrical tank and topped that with my black leather blazer. I chose my mini dot hose and my knee high flat boots for footwear. I've been wearing heels a lot lately and my wonky knee needs a break. No jewelry other than a black and silver chunky ring and I went with my quilted cobalt/cream/black handbag. What are thoughts on this outfit? As always, all comments/suggestions welcome. P.S. Gain says good morning and would like to note that his orange fur works really well with cobalt. Today's outfit started with my burgundy skinnies which turned out to be a fantastic purchase for fall/winter. I paired them with my cream/black dalmation print wrap blouse with hi-lo hemline. 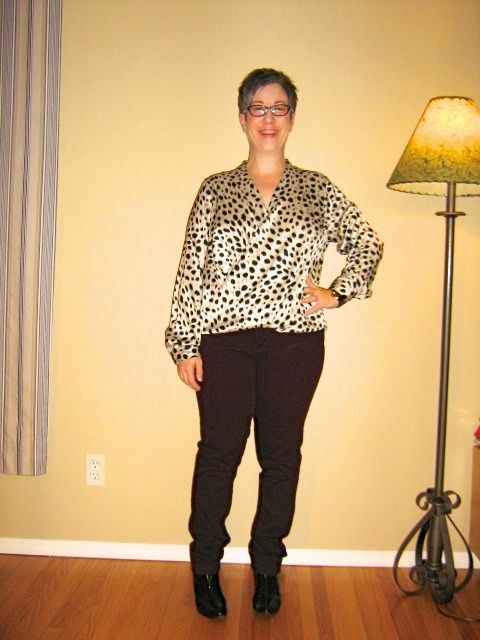 This blouse is definitely an item I would describe as not conventionally flattering - it hides my waist and much of my shape while at the same time, making sure no wobbly bits or muffin top are visible. I then added black patent bookends with my booties and a recently thrifted Danier Leather clutch. Yep - found this pretty shiny baby at Value Village for $3.99! Gold wedding band and rose gold/black watch complete the outfit. Yep - with the windchill this morning, it's -42 Celcius. So I decided to wear a dress - lol! Fear not about my legs. I have two pairs of tights on so all nice and cozy. Today's outfit started out actually with my purple tights - just felt like wearing them. So I added a black pair underneath topped with the purple. 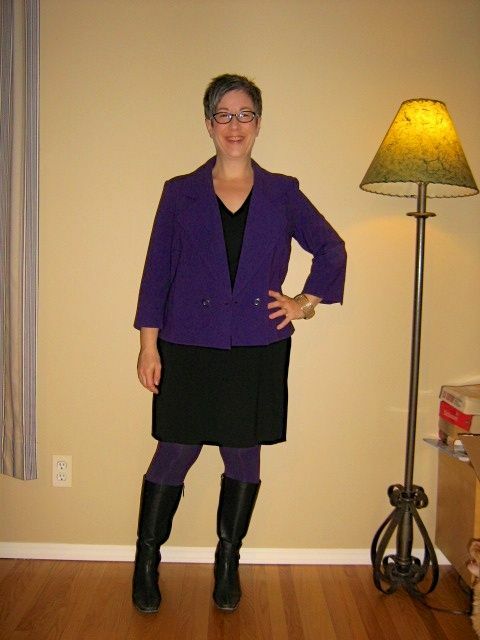 Then I added my black sheath dress and for a topper, am repeating the purple with my Amber Sun jacket. I love this jacket (waving hi to MaryK jacket twin!). Does this quality as boxy and cropped for the spring trend? For footwear I chose my ancient, warm and comfy Clarks knee high boots and went with my black handbag and gold mesh bangle for accessories. I'm happy with this outfit - what do you think? As always all comments/suggestions welcome. Life has become unbelievably busy - a major event at work has thrown my days into a state of chaos and home is just as crazy. So I want to wear outfits that are still stylish but have an emphasis on comfort and ease of wearing. Today's outfit started with these new Express Editor Glen plaid bootcut trousers. I wanted some trousers that were not black, had some pattern and could read as a false grey. Bingo! I paired the trousers with a simple black knit pull over, which I've faux tucked into the belt. I guess this outfit is akin to Angie's formula of bootcut trousers with fluid knit top. My black patent booties, black with gold hardware handbag and rose gold/black watch round out the outfit. So what do you think? Does this work? I can tell already I'm going to love these trousers. Soooooooo comfy. As always, all comments/suggestions welcome. P.S. Going for an eye exam after work today - I know my prescription has changed again. My eyes have been driving me crazy. Might need your help in a couple of days to pick new glasses. I wanted to purchase a skirt suit for my new job for those days when I'm in more "official" meetings with the Board, government officials, etc. so I turned to Nygard, a Canadian brand that has always produced good quality suits in various fabrications and styles and to put the cherry on top, they come in petite sizes as well. 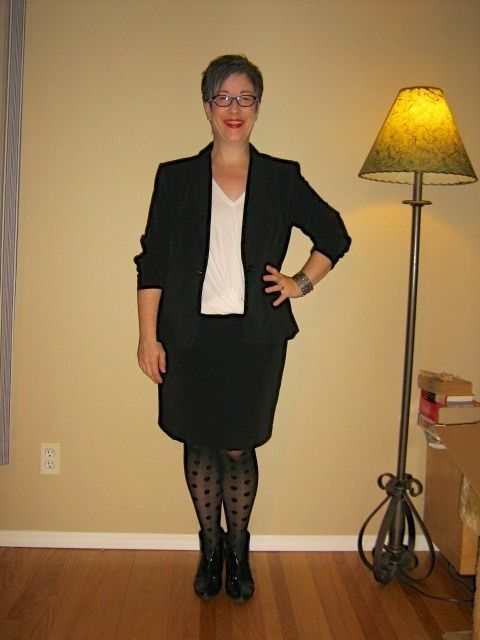 I found this black blazer and skirt suit on Boxing Day and it fit my needs perfectly - they produce new suits every year with tweaks to represent the current trends. This blazer for example is a bit longer, lower single button stance and narrower lapels. For the top underneath the blazer, I chose the white silk blend v-neck cross body hi-low hem top my DS gave me for Christmas. I had been looking for a slouchy white tee for some time and this was perfect. And then to add a bit of Shannon style, I added my large polka dot hose for a bit of whimsy, my black patent booties and my oversized animal print clutch. My silver wedding band and a large gun metal cuff, along with my signature red lip, complete the look. Unfortunately I don't think this photographed as well as it looks IRL - oh well. So what do you think? Corporate without being stuffy? As always, comments/suggestions welcome. BTW I'm in meetings most of the day so may not be able to come back and read your comments until much later. I enjoyed wearing my leather jacket so much yesterday that I went with leather again today - this time in cream. 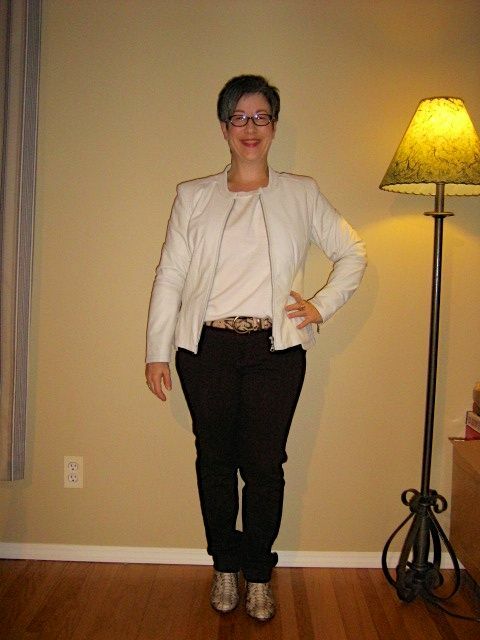 I went with my python booties to pick up more of the cream colour and to bookend my snakeskin belt. I was going to use my large cream handbag but just got too lazy to change bags this morning - I hope my black leather handbag looks ok. I added a swipe of plum lipstick and a couple of rings and I'm ready to go. So what do you think? Does this work together? As always, all comments/suggestions welcome. It is yet another bitterly cold day here and I wanted to wear something warm and edgy. I have only worn the Spiegel "lemming" leather jacket as outer wear so far and decided today to wear it as a blazer. That was the starting point for today's outfit. Underneath the leather jacket, I have on a simple black knit tank. I know it seems silly to wear a sleeveless item underneath, especially when it's so cold but believe me, when the menopausal hot flush hits, off comes the jacket and a sleeveless tank is exactly the right choice! 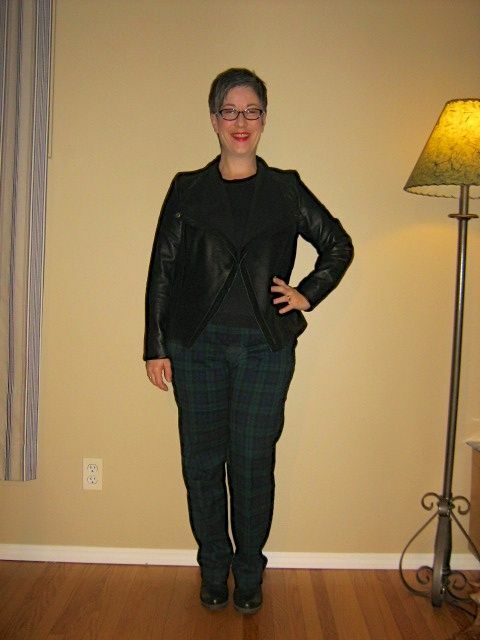 For my bottoms, I went with my Blackwatch plaid trousers - one of my favourite purchases for F/W 2013. I went with my Doc Marcies for footwear and my black Danier handbag. No jewelry other than my silver wedding band and a silver ring on my other hand. And yeah…and red lipstick of course! This might be too much black and too much black leather for some, but it feels right to me for today.What do you think? does it all work together? As always, all comments/suggestions welcome. 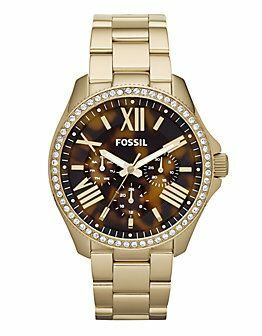 Since I bought my rose gold/black Fossil watch in the summer, I have come to love wearing a bold watch and find I'm wearing bracelets less and less and turning to my watch as my "arm candy". My thrifted gold one isn't thrilling me much these days so I'm wanting to replace it with either gold or a gold/silver combination. I have narrowed it down to either this Fossil gold with tortoise face or gold/silver Michael Kors twist watch (an Angie choice in 2013). Price wise these are both in my budget. Everything in this outfit today (indoor and out) is over a year old and in some instances, two years. Just goes to show that choosing wisely in the first place leads to pieces you still love further on down the road. Today's outfit started with my trusty ponte knit sheath dress. I combined the dress with small dot hose and my knee high black flat heel boots (my knee needs a break from heels today). 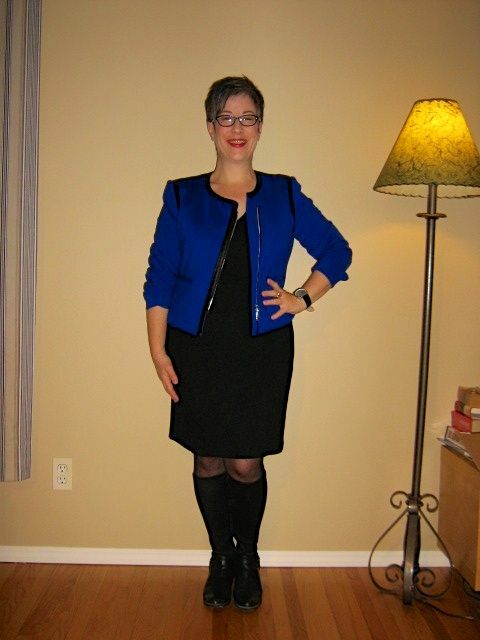 On top of that, my jacket choice for today was my cobalt, asymmetrical, moto style jacket with black leather trim. 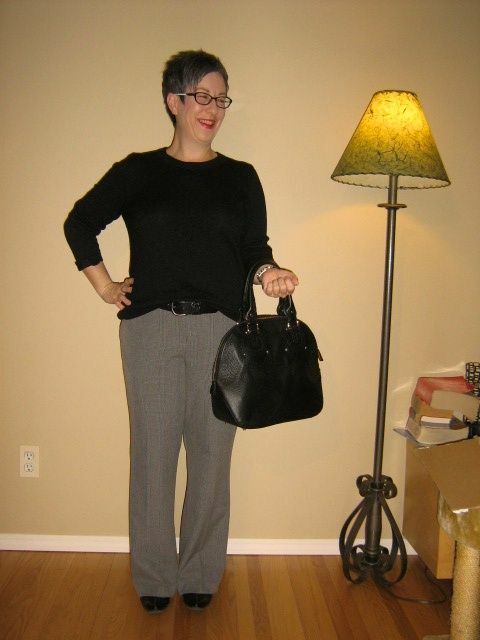 Jewelry choices were my oversized black/white watch and a silver ring and I went with my black leather handbag - again. When I head out the door into the cold, everything will be topped with my red knee length puffer coat, white scarf and white gloves. I realize in the winter that I don't rotate my handbags as much and tend to just go with a couple because I want the handbag to work with my outdoor coat as well and some of mine look great with the outfit but not so much with the coat. Have you other winter weather ladies found the same? So what do you think of the outfit? does it all work together? As always, all comments/suggestions welcome.